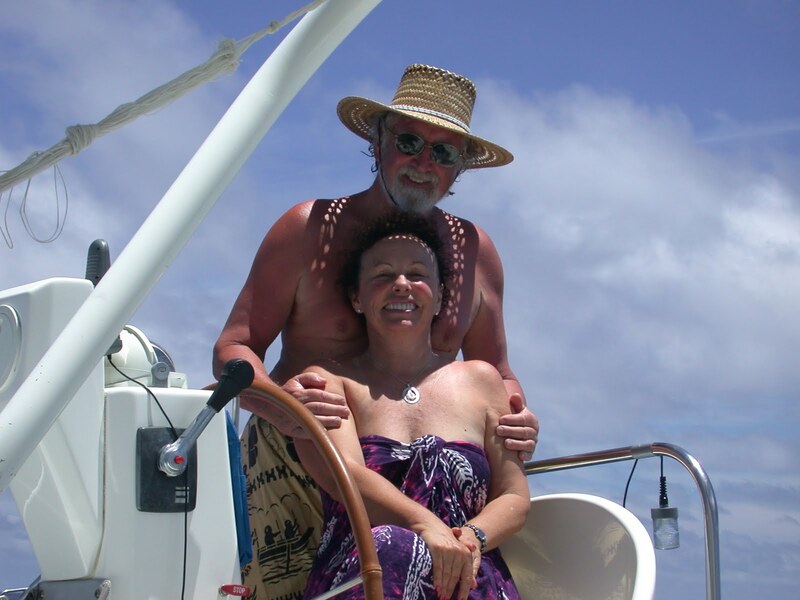 Lois and Gunter Hofmann are a married couple who cruised from 2000 until 2008 aboard the catamaran Pacific Bliss, a 43 foot Catana 431 hailing from San Diego, CA. During those years they completed a circumnavigation logging 34,000 nm and visiting 62 countries. They began in France where the boat was built, going back to San Diego over the years during cyclone or hurricane season, or when they needed a break and had the boat in a safe place. They returned back to Canet, France to the very same dock they had left. More on their trip can be found on their website and in their forthcoming book and they can be contacted through their website or email (loisjoyhofmann@yahoo.com, gunterahofmann@yahoo.com). They add: As the saying goes, "every year spent cruising is a year you do not age," and we believe it. After 8 years at sea, we feel younger than ever! So don't let age keep you from circumnavigating! We had a dream of cruising when we retired. 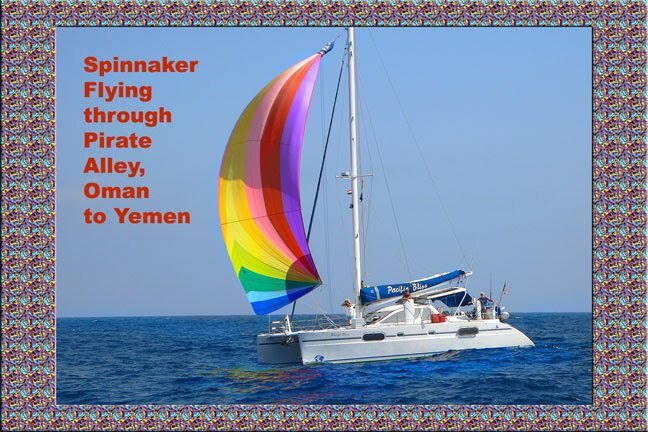 We might not have ordered the catamaran and cast off those bowlines, though, if it were not for some personal circumstances that caused us to want to escape. We yearned for control and freedom over our lives. What we found and learned at sea was much, much more. Yes, the technology really changed over the eight years. GPS is the greatest! As the navigator, Lois began using paper charts, but we ended up relying on mostly electronic charts, with paper as the back-up. We did not have email capability when we began. Then sailmail came on the scene, which allowed us to transmit via our SSB. We did not have a satellite phone initially. In 2002, we purchased an Iridium satellite phone, which allowed us to call our elderly parents, and also our broker to talk us through some technical repairs while at sea. Over the years, how much time do you think you spend at anchor, sailing and motoring? We never kept exact records of this, but since we made many inland trips, probably 25% of the time was spent sailing. 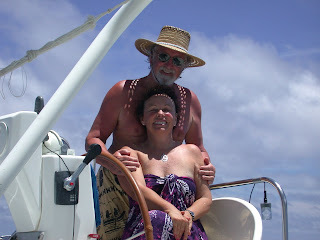 When at sea though, we sailed whenever we could, which was 90% on ocean crossings such as San Diego-to-Marquesas, Cape Verde-to-St. Lucia, and Thailand-to-Salala, Oman. The longest motoring stretch was "uphill" from the Panama Canal to San Diego. We always used 3 hour watch schedules, with or without additional crew. During passages over one week long, we would usually have one or two crew. We liked having all the gear, but could have done with fewer clothes. Gunter had so many spare parts on Pacific Bliss that one catamaran sailor called her "the supply boat." So much, that sometimes he forgot what we had. Mostly though, these spares came in handy. We even used our spare flux-gate compass, spare computer, etc. The one we did not have to use was our spare hydraulic steering system, the original one lasted 34,000 miles, but we would not have felt comfortable leaving it on the dock. We budgeted about $30,000 per year, not counting the cost of the boat, spare parts, repairs and maintenance. There are two categories to bring with you: (1) give-aways, the best to bring are sunglasses and prescription glasses, baby and children's used clothing, extra canned foods and staples, and toys/coloring books/crayons. We gave away boxes of glasses and clothing in the Banks Islands of Vanuatu, and even our spare dinghy prop to a village for their lone fishing boat; we gave away canned goods and staples (rice and flour) to families in a cyclone-devasted village in Tonga (2) trading, all batteries, esp D-cell, T-shirts. If you have not cruised before, take a "basic training" cruising course to see whether it is for you. We took the one offered by John Neal, a 1000-mile sail from Raratonga to American Samoa. Make sure that each of you knows how to navigate, run the SSB, sail, motor, run the dinghy, etc. in case the other is incapacitated. To keep the peace and to make sure each of you feels important, divvy up the responsibilities and take courses increase competence and confidence. In our case, Gunter was the Captain, Lois was the Navigator. Lois also managed the radio communications and did most of the cooking. Gunter did all the mechanical work. Fixing the boat is a major challenge in remote areas; some men who come from occupations such as finance (vs. engineering, for example) give up cruising because of this. Women who feel like an unappreciated "galley slave" cooking and cleaning the boat, also give up. If a couple cannot live together on land 24/7 without getting away from each other part of every day, don't expect to live together confined to a boat for weeks at a time. What lessons in life going forward did you learn at sea? We learned that one is never totally in control; we are at the mercy of God and nature. Learn how to pray! We learned flexibility, how to go with the flow (in this case, the wind and weather). A cruising boat is not a plane or train or even a cruise ship. Firm shedules are the enemy of safety on board. When friends or crew join you, provide a place or a time, not both.